The Bigfoot on the Strip is one of the best attractions in Branson where you can enjoy many kinds of fun activities. Bigfoot on the Strip features many other attractions that offer exciting activities such as the Bigfoot Adventure Golf, Bigfoot Action Tower, Adventure Maze, Arcade, and Food Truck Dining Park. Bigfoot on the Strip is the only location in the world that offers such fun activities. These attractions in Branson can be enjoyed while playing at the Bigfoot Adventure Golf. The Bigfoot Adventure Golf is a themed mini-golf adventure that will leave you in awe as you play on the 18-hole golf course. As you compete on the 18-hole golf course, keep an eye for the Bigfoot. You will walk through the Ozarks woodlands, frozen Tibetan Tundra, and desert highlands. During this mini golf experience, you can walk through Bigfoot’s cave and watch how the paint itself changes colors and how objects start appearing. You’ll get to see the 270-foot tunnel cave hand-painted by Springfield artist Emily Million using UV paint so the painted animals glow. After you have journeyed through the cave, you’ll enter the frozen tundra and continue to play your way through the 18-hole fun, an exciting and somewhat challenging holes. This mini-golf course will take you up, down, and through a cave and up some stairs as you compete for that hole-in one. Yes, there are stairs. While you’re on the higher hole, you can look down into Yeti Fun Zone & Monkey Jump. You’re sure to have fun as you watch those brave enough jumping off of the Monkey Jump. 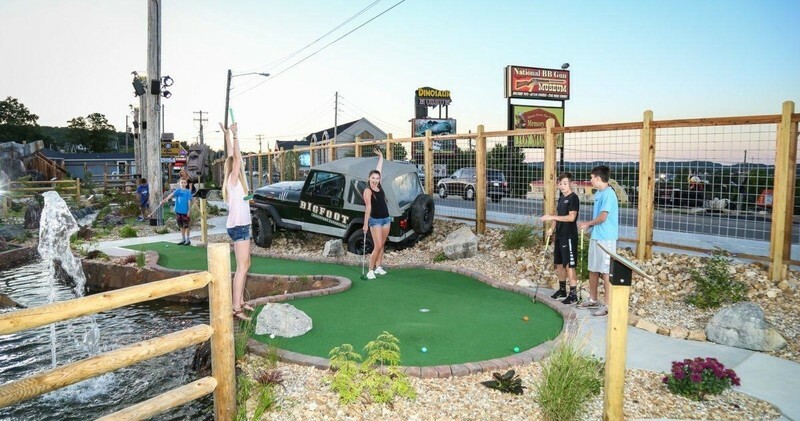 The Mini-Golf Adventure at Bigfoot on the Strip creates a fantastic time for all ages, so do not miss out on the opportunity to enjoy the fun on this mini golf course during your next vacation to Branson. The mini-golf course at the Bigfoot is beautifully designed and hand-painted to feature some stunning settings. Don’t miss to explore the Woodlands, Cave, and Frozen Tundra while you keep your eyes stared for Bigfoot himself. The action tower at the Bigfoot on the Strip is 200 feet tall and features two rides, the Gravity Bomb and the Saddle Sling. The Gravity Bomb is a free-fall ride that uses an earth magnet break system instead of wires and electricity. The Gravity Bomb is capable of holding eight people, and it allows the riders to take a picturesque view of Branson before dropping. The Saddle Sling is a two-person ride that straps riders over their shoulders and waist and slings them in the air. The Bigfoot Adventure Maze has features of multiple levels and lots of climbing. The 4,000 square feet arcade features 60 games that include autographed sports memorabilia and Bigfoot themed prizes. The food trucks feature barbecue, artisan-style pizza and a dessert truck with backed goods and ice cream. As one of the most unique attractions in Branson, the Bigfoot on the Strip is a great place where you can enjoy many kinds of fun activities.